Crete, the most Southern Island in Europe has it all! It has everything combined, from mountain villages, long sandy beaches, small towns, peace and if you like to have a party, there is a vivid nightlife. There are beautiful mountainviews, water-sports, deserted places and a clean sea where you can swim in. The sun shines for more than 300 days a year and it has one of the best climates in Europe. Being the biggest island of Greece, it's understandable that it's a popular travel and holiday destination. Crete is magic ! During the day there is pure quality sunlight and during the night you can look at the million stars in the sky. There is an influence of wildlife, plants and flora that are unique for the island. Breath in the constant smell of wild herbs, taste fresh fruits, the best olive oil of the world and the healthiest cheeses. Enjoy the delight of drinking a Greek coffee by the side of the road in a mountain village, the excitement of the happenings, traditional weddings and baptisms, the history, the people and the visitors from everywhere in the world. It's also a paradise for the historian and the archeologist. The people of Crete are open hearted and hospitable and have a tradition of welcoming visitors. The tradition and culture that are offered in their music, art and food matter to make this image. It combines the European ways with the unique local habbits. Why buy a property in Crete ? Having a swim and sitting in the sun in your own pool, dining at your barbeque and serving vegetarian salads from your own garden. Your own plants, flowers and trees. Looking at the sunset from your own porch, while drinking a glass of the finest wine that Greece produces or just going for a walk, filling your haert and thoughts with uncomparable images. Crete has everything in it's nature, from herbs to lemontrees and orangetrees, wine and olive grooves. Even avocado and bananatrees, tropical phoenixes complete the perfect scenery of aroma's and views, which make you feel closer to nature. Because the climate is warm during the biggest part of the year, you can spend a lot of time outside. There is an entire 'inside/outside' culture, which makes the one an extension of the other. 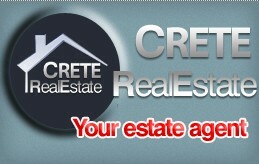 How do we see the Real Estate market evolve in Crete. Crete has proven the latest years to be one the most popular holiday destination of the Europeans, that come to enjoy their pension or are looking for a investment property. Why is Crete so attractive in comparison with other places ? The Climate. The summer is dry, warm and takes up most of the year. The winter doens't last long and isn't like in Northern Europe where there is a lot of snow and frosty roads. With an avarage of 310 days of sunshine, spectacular sunrises and sunsets, followed with fabulous stars and moonlight during the nights. The beauty of the nature and the scenery. Beautiful beaches, majestic mountaintops, caves. Old historical places, untouched and unspoiled villages with charachter and tradition. The cost of life. Studies have shown that the cost of life in Crete is 30 % lower than in Cyprus, while Cyprus is already 30 % cheaper than Spain and Portugal. The low crime rates. According to official data, the crime rate of Crete is only 3 % of the British and 2 % of the Spanish. Crete is a part of the European Union. It's part of an non poluted country. The closest European destination to the sun. The warmth and hospitality of the Cretan people. Crete – a clever investment. Properties in Crete are in comparison to Spain and the south of France very affordable. However since Greece has joined the European Union, prices have gone up year after year. And one thing you can be sure of is that unlike Spain, when you are given a legal building permit by the proper authorities they will never tell you after a couple of years that your permit is revoked and that your property will be demolished. This is something you only hear in Spain. Also your plot is your plot, nobody can just take over a piece of your plot. Your ownership title counts for a 100 %.